My mother-in-law’s birthday was back in January, and unfortunately, the perpetually insane schedules we keep in our house coupled with the distance factor (we’re about 4 hours apart) have prevented a celebration from taking place for the last eight weeks. And that is precisely why we’re making up for it in style. We’ll descend upon Atlantic City this week for a reunion-slash-birthday extravaganza that will include indulging at a few of the famous resorts’ fine dining establishments (a little something here, a lot of something else there…), a bit of gambling, and no doubt a cocktail or two. It’s not that I’m trying to earn brownie points, but I naturally felt compelled to present a stellar dessert for the occasion. This is the first time I’ve ever had a mother-in-law with a birthday! Though to be fair, this is the first time I’ve had a mother-in-law at all…coincidence, I guess. I used brown butter in the base cake, because in my mind that nutty flavor is reminiscent of cracking into a little biscotti with your morning cup. 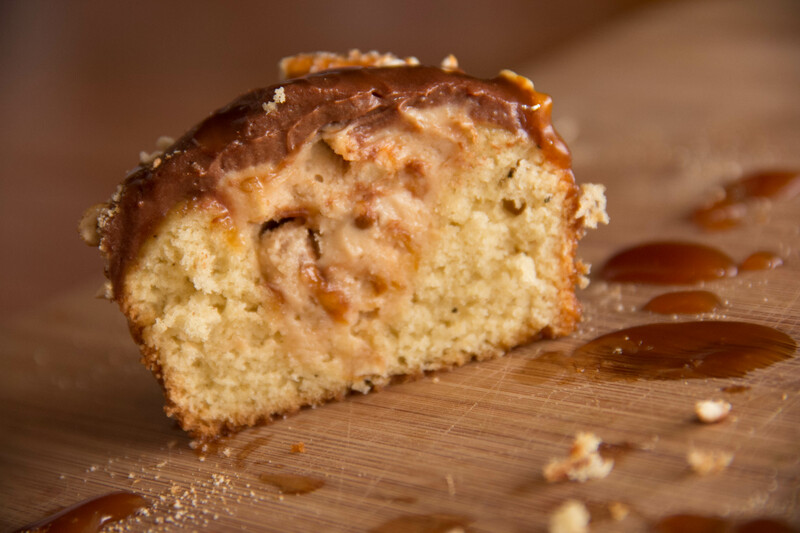 The pretzels were added for crunch, and a drizzle of caramel over the top of the coffee-infused frosting is meant to mimic the coffee shop interpretation of the macchiato. Or maybe just because it freakin’ tastes great. 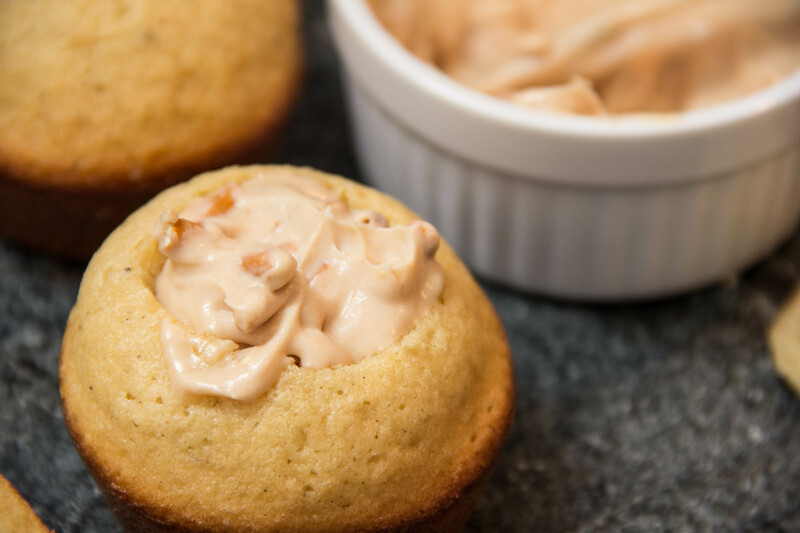 But by far, my favorite component of this cupcake is the goat cheese caramel filling – the tartness of the Chèvre cuts the burnt sugar caramel sweetness; it’s complex and interesting enough to make you want to just keep eating. Which I did. All day. And maybe I made a little extra. Now this is not to say we won’t still split the Baked Alaska at Bobby Flay Steak, which I’m told is on the evening’s agenda, but at some point we’ll make room for second dessert. And really, since they’re like tiny-little cake-shaped cups o’joe, they really lend themselves to the “morning after” so I’m sure we’ll find a time to enjoy them either way! Heat the butter over moderate heat until it begins to simmer. Stir occasionally and keep at medium heat until the butter turns brown and flecks of brown solids begin to settle in the pot. Remove from heat and sit in an ice bath until the butter sets. Once it has returned to a semi-solid state, mix the butter well. Whisk together Flour, Baking Powder and Soda, and Salt. 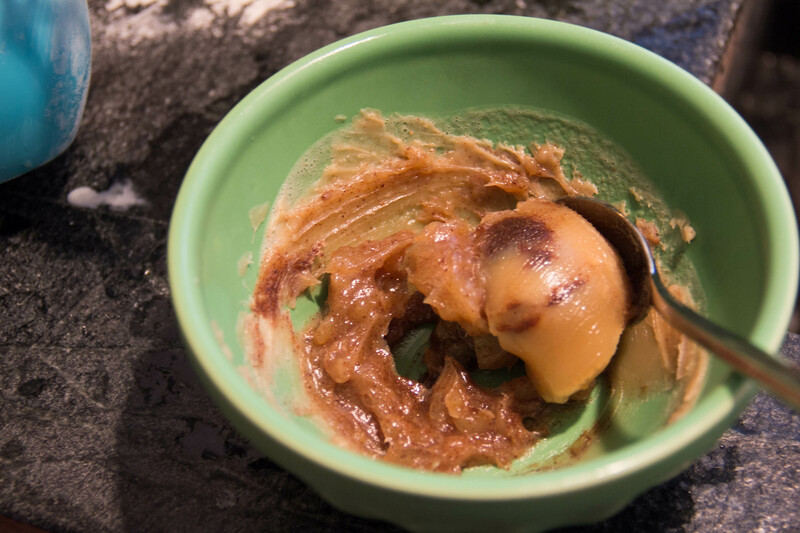 In a separate bowl, use an electric mixer to beat the brown butter and sugar. Add in eggs, flour mixture, and milk and beat until creamy. 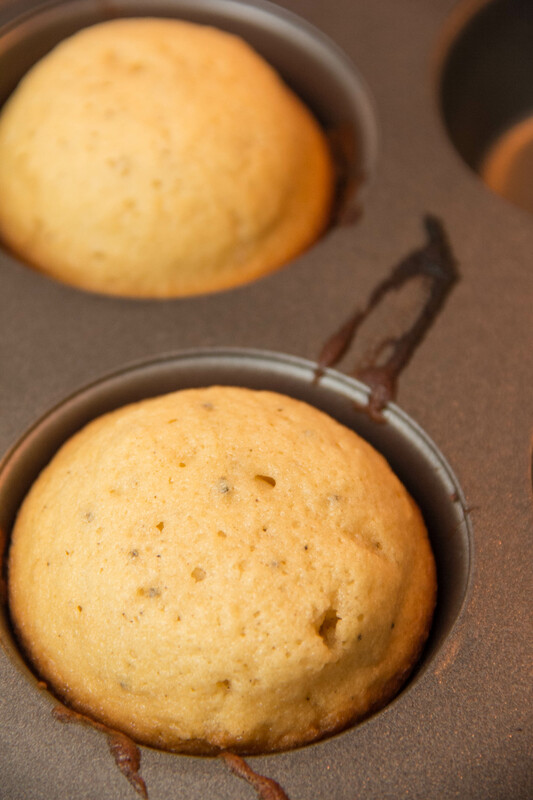 Separate into cupcake pan, filling each cavity about halfway. 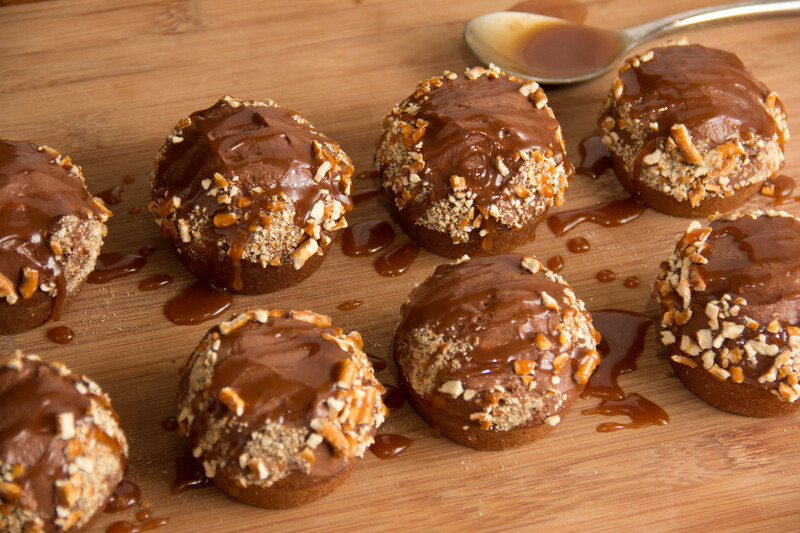 Bake for 12 – 15 minutes or until fluffy and golden, brown butter delicious looking! Beat together with an electric mixer until fluffy and smooth, making sure the cheese is well incorporated. Mix in crushed pretzels. Cook the sugar over medium heat until it begins to bubble and melt. As it begins to brown, stir occasionally and be careful not to burn – keep cooking the sugar until it is a deep brown, almost a cinnamon color. Once you’ve achieved this (and it takes some practice! ), remove the sugar from the heat. Very carefully whisk in the heavy cream (a little at a time), the butter, and the salt. Set aside to cool. 2 Tbsp* (good!) Ground Coffee – the better the coffee, the better the infusion will be; don’t use coffee you wouldn’t drink! I used Stumptown. *This ratio will produce a frosting that has a fairly aggressive coffee bitterness. If you don’t particularly care for that flavor, knock it down to 1 tbsp. Set aside one 1/2 cup of heavy cream. 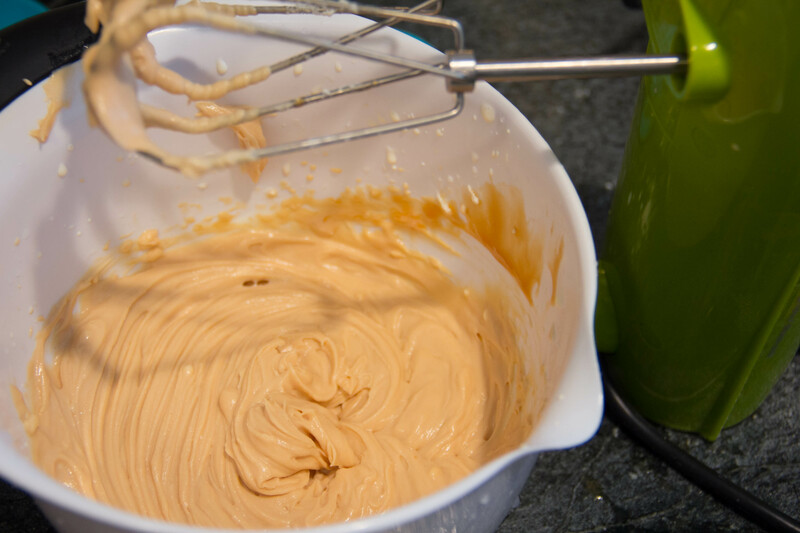 Using a hand mixer, beat the cream until it doubles in volume for a full, rich whipped cream. Pour the remaining 1 and 1/2 cup into a saucepot, along with the coffee grounds. Over medium heat, bring the cream to a simmer; the heat will extract the flavor. Let the cream steep for about thirty minutes, then bring to a simmer again. Strain thoroughly before pouring over the chopped chocolate (I actually used my coffee filter to strain – what better instrument to filter coffee?). Stir until the cream is blended into the chocolate and you have a rich ganache. Once the ganache has cooled, gently fold in the whipped cream you’ve made. 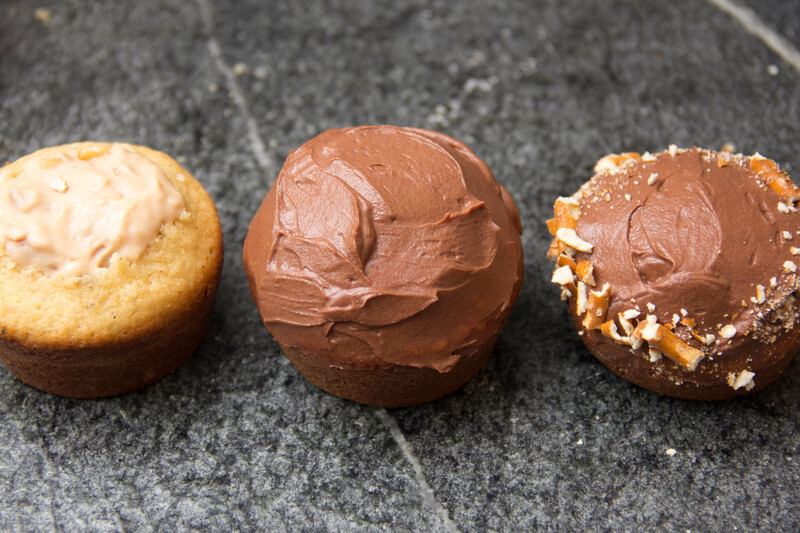 This will add body to the frosting and lighten the flavor a bit. 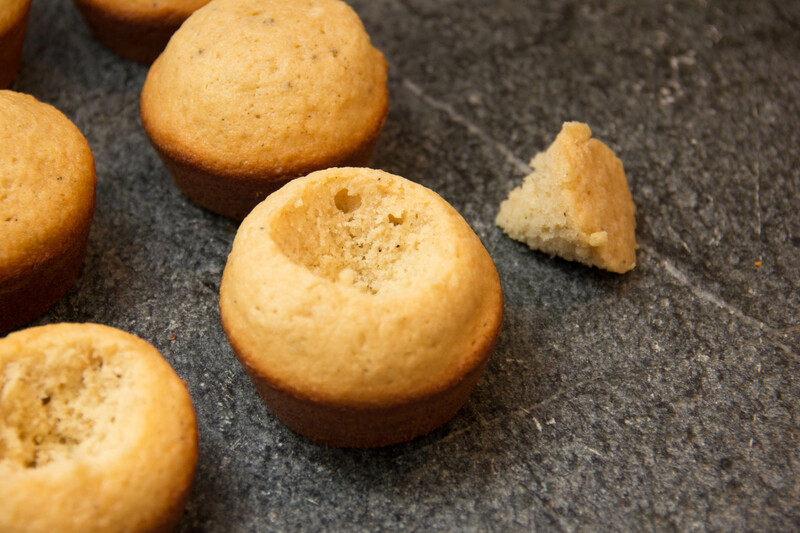 Once the cupcakes have cooled, use a sharp pairing knife to remove cone-shaped chunks from the center, as pictured. 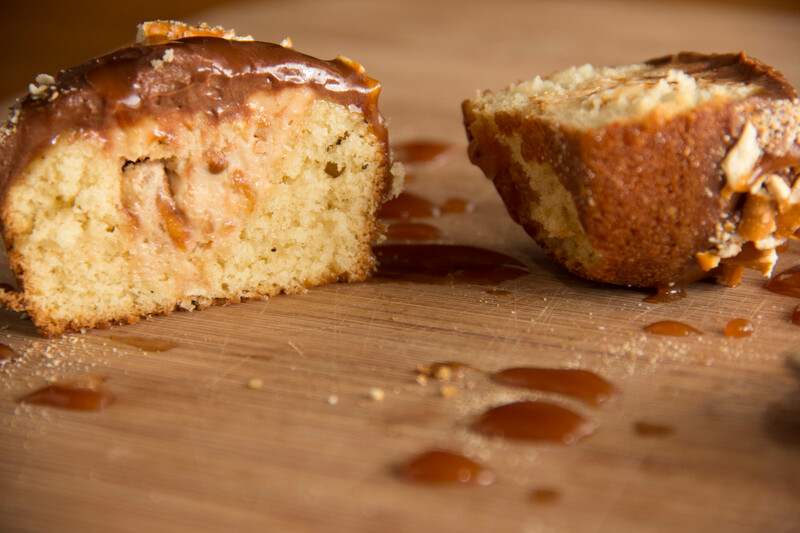 Fill the cavity with the Caramel Goat Cheese mixture until flush with the cakes’ top, cover with Coffee-Chocolate Frosting, and garnish with crushed pretzels. 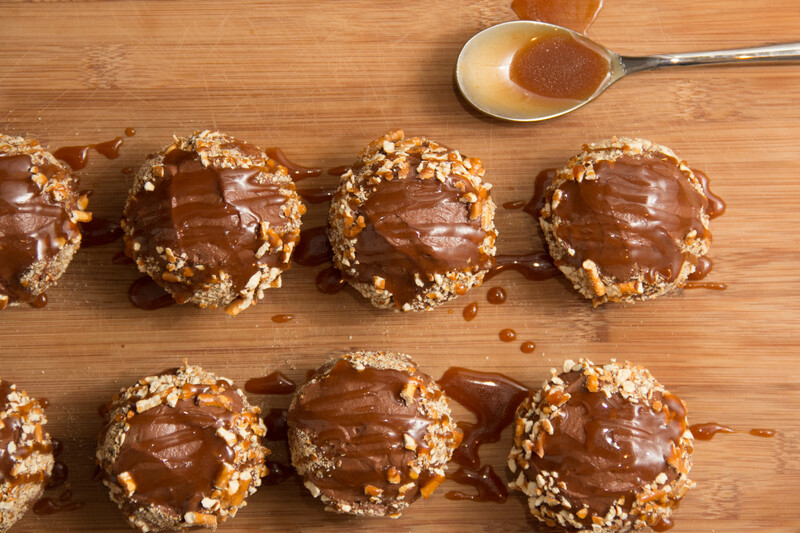 Finally, heat up about a 1/4 cup of your salted caramel, drizzle over the top, and go hit the slots!